These high quality pictures can be printed up to A3 in size without any loss of quality. 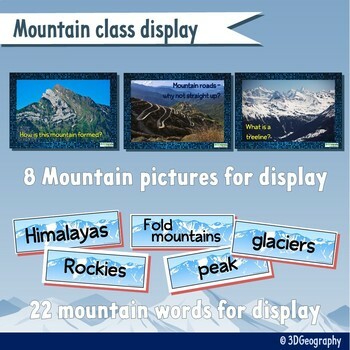 In this resource, there are 8 mountain pictures and 20 mountain words for you to print off, laminate and use in your classroom today. * Looking at life in the mountains - two viewpoints. * An A-Z of mountains. * Locating mountain ranges on maps. * Describing the mountain environment. * The templates to make 4 different mountain formations - hill, knoll, plateau, ridge. * Mountain themed lined paper. * Mountain themed groups names. * Success criteria for two of the activities. 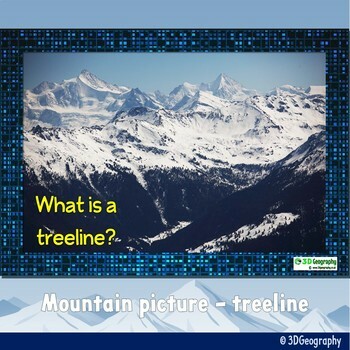 This complete lesson comes with activity worksheets and PowerPoint and is ready to use straight away. It looks at using online mapping tools like google maps to identify different mountain ranges on a map of Europe and on a map of the UK.